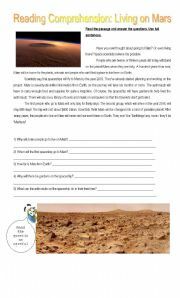 READING COMPREHENSION: WILL OUR EARTH SURVIVE? 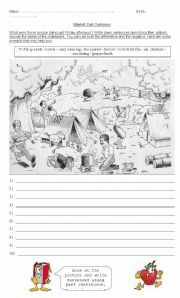 In this activity, the students have to answer the questions using "will" and the information provided by the text. I hope you like it! 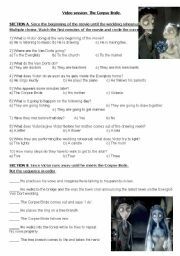 In this worksheet, you´ll find two activities on the first half hour of the movie "The Corpse Bride". The students have to watch the movie and complete. One, a multiple choice activity; the other, putting the sequence in order. Enjoy it! 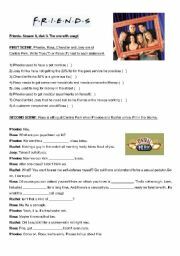 This worksheet is based on the episode with "Unagi", season 6, disk 3. There are some comprehension activities to do with the first half of the episode. I hope you like it! 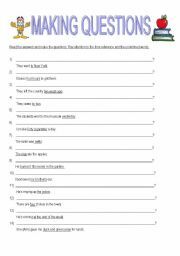 This is a reading comprehension activity on future tense. The students have to read the different paragraphs and answer the questions using will or be going to. I hope you like it! 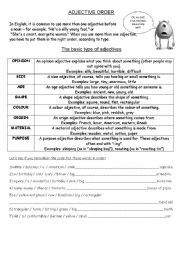 This worksheet presents the theory of order of adjectives. It includes an exercise to start practising. Enjoy it! 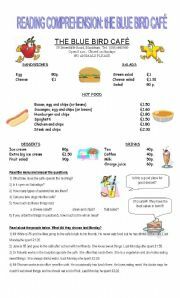 The students have to answer questions based on the menu of the café. Challenging activity. I hope you like it! This worksheet is a test on past continuous. The students have to look at the pìcture and write sentences. There are some helping phrases. I hope you like it! Reading comprehension on Past Continuous. Enjoy it! 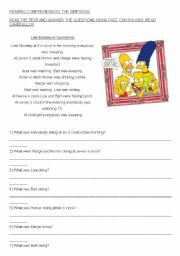 This worksheet provides practice on making questions in the Simple Present, Present Continuous and Simple Past. The questions has to be made based on the underline part of the answer. Enjoy it! 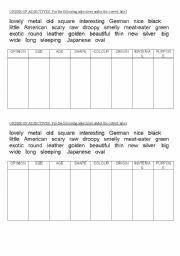 THIS IS A WORKSHEET ON ORDER OF ADJECTIVES. ENJOY IT!